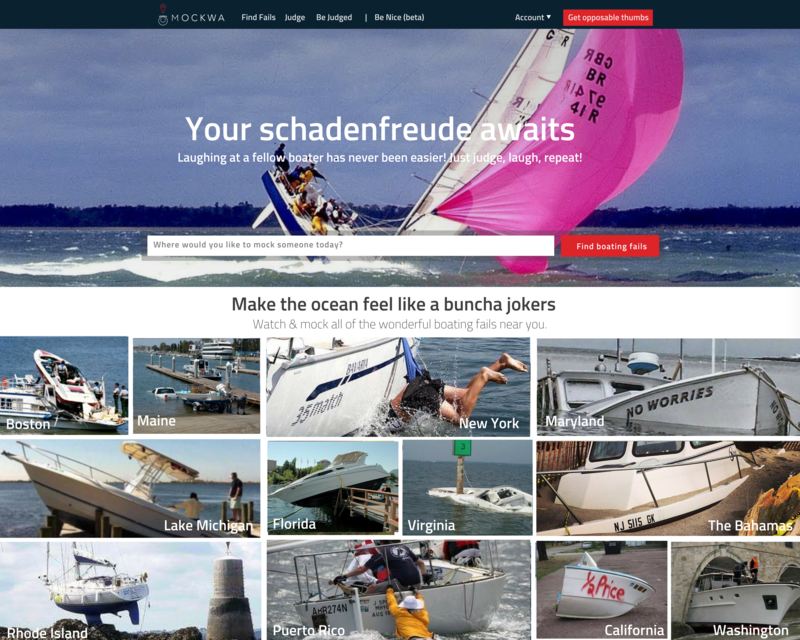 According to some recent and extremely scientific studies, each day thousands of boaters and sailors take to the water as well as the world wide web to critique literally everything about their fellow mariners, from docking mishaps and sail trim to choice of boat, price of boat, boat name – the list of screw-ups is, apparently, endless. After scouring decades of videos, photos, and unforgiving commentary of epic boating fails, we've developed new technology that allows boaters to upload and share images of boating fails on-the-go, and encourage the boating community to mock their fellow mariner instantly, accurately, and from anywhere. With one push of a button, the Mockwa app captures the photo or video of the boating fail in question, IDs the vessel, assesses what the captain and/or crew has done wrong, and posts the information to social media channels, thus alerting the captain as to his incompetence. "The Mockwa app pushes the boundaries of AI and humanity's capacity for snark," said Mockwa CTO John Fakero. "It's human nature to rubberneck at an accident scene; Mockwa allows boaters to observe, share, and quickly reach a consensus as to the point of failure, and invite the world to share its disdain for the boater at fault with pinpoint accuracy." "We thought we'd hit a snag when it came to sail trim," added another Mockwa engineer. "Luckily sailors are extremely vocal both on and off the race course and more than willing to, er, 'help' their competition. "They need to know," said Dockmaster Charlie Flair. "What a bunch of dummies floating around out here!" As for technophobes who prefer the old-school method of reposting memes from the 1990s or photos with no identifiable information? "Go down to the local middle school and find a third grader to help you use Mockwa. Technology is here to help the world laugh at every one of us as we try our darnedest, and the best defense is a good offense."